I think that this is an interesting thing going on here in Albany. 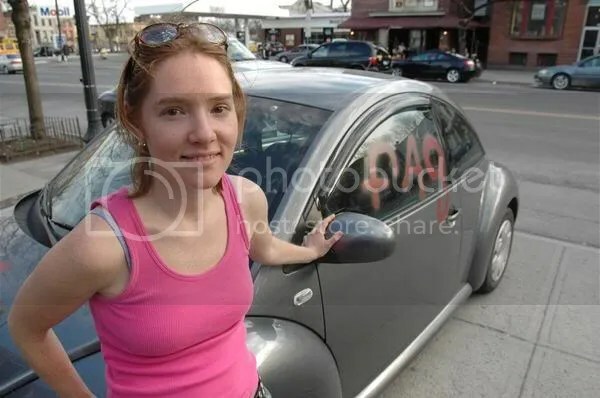 A student at Russell Sage College had her VW Bug vandalized. She’s a lesbian and the defacer spray painted in red, U R gay and fag. Ms. Davies, the car’s owner, decided against having the insurance company fix the car and instead is choosing to drive it around in public so as to raise attention to harassment that many gay and lesbian people say that they face. Interesting. She’s also getting in on the publicity end in a different way altogether, making a documentary of it and choosing to go across country in the gray beetle, with the spray paint still on it. I’m sure she’ll be pulled over quite a few times on her quest, and police will be called when she pulls her VW up in front of a diner in Battle Creek, Michigan, but that’s the point. It’s free speech, right? I applaud her for making some lemonade out of the issue. I do think she’ll face some ridicule, but hey, sounds like she’ll have some fun seeing the country. I’m all for FREE SPEECH! I love Erin. She’s amazing!! !